Happy Tuesday loves! I don't know about you but I have been loving all things denim lately. I have even been on the hunt for some cute, denim shortalls to rock this spring/summer so when I came across this fun lace up denim dress from Tobi I knew I had to have it! The shift silhouette is perfect for hot summer days and the best part? It has pockets! You already know how much I love dresses with pockets, don't ask me why, I just do! I kept this look pretty casual since as you can tell from these pictures, it was a bit of a rainy day. Funny enough it actually ended up cleaning up and being a gorgeous afternoon which made this the perfect outfit for the day. To avoid sinking into the ground as I walked I paired the dress with the comfiest DV wedges and a fun fedora since my hair was no cooperating. This dress is so cute it really doesn't need a ton of accessories to dress it up and my favorite part? Tobi has 50% off your first order so this dress is under $40! LOVE the neckline...so pretty on you! I loooooove this on you! The color, the lace up detail, and the hat! Perfect! I LOVE the lace-up front! So pretty and summery! this is super cute! lace up front is awesome. and those wedges are perfect with it! add just enough height and still have the comfort factor. love! I love those wedges, I saw them at Target the other day and DV has just been killing it with that line there lately. Such a cute dress & you are rockin it! I love the wedges and hat too, great look! so dang cute!! you totally worked it in the rain!! So so cute! Those wedges are amazing! Perfect summer look! I love the dress and wedges! You look fab! Um, I need this dress. Perfect for summer! 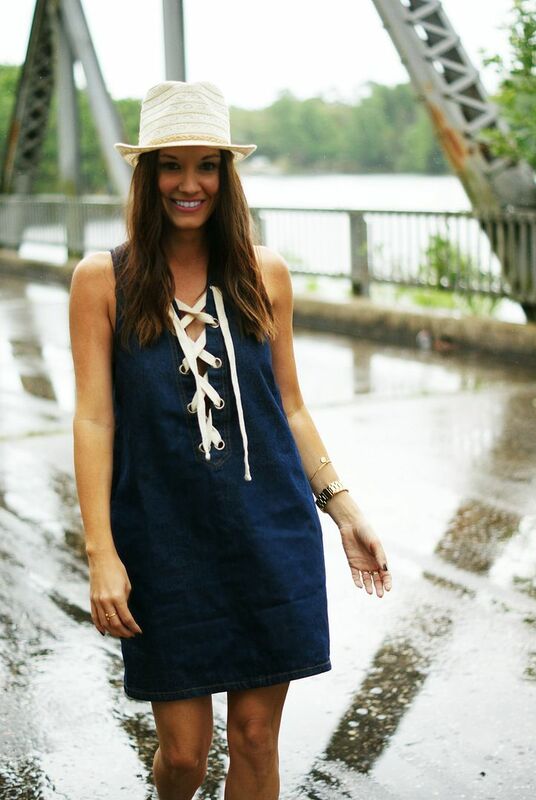 This denim dress is too cool, lady- and love those wedges! So cute! Love this version of the dress with the no sleeves and pockets! Those wedges are so cute! Pockets in a dress are a must! How did you find it sizing wise? True to size? Dresses with pockets are the absolute best! The skirt I have on today was purchased only because I discovered the pockets when trying it on. Love this dress on you! That is seriously such a cute outfit! 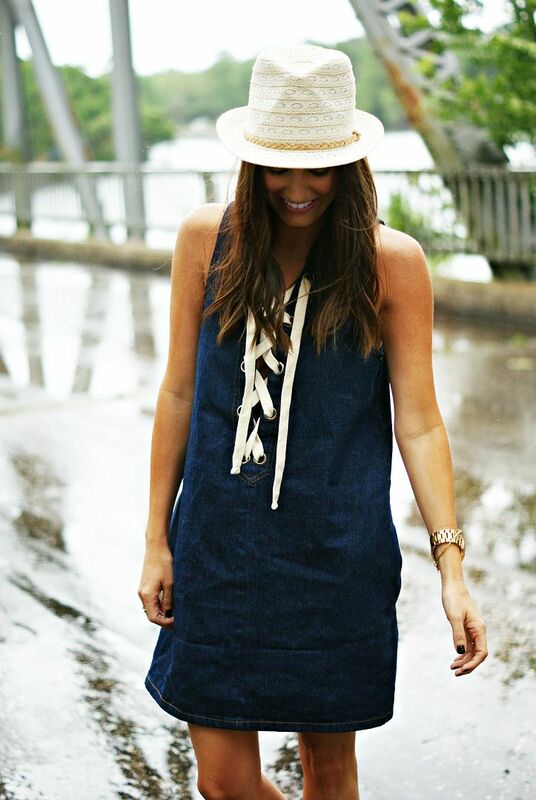 I love the lace up detailing on the top of the dress, and how you paired it with that fedora! It's just so fun and perfect for the weekend! Such a perfect summer look!!! I love how easy this would be to throw on before heading to town or a boardwalk during summer. This dress is amazing! I love the oversize lace-up detail- so fun!! You look fabulous! This dress is perfection. Demin + white is always a winning combo and POCKETS! Gotta have those. this dress is so freaking adorable! love the lace up detail. you would rock the shortalls so i hope you find some! This reminds me of all the cute denim dresses that I had in college and I have no idea where they have gone. Those shoes so comfortable and perfect neutral color for spring and summer outfits. I love your wedges! super awesome look! so I really love the tie up the front, that is so cute!!! What a fun embellishment. Love that look! Those wedges are great... I've been loving denim, too! This is so cute! Loving the lace up tops/dresses lately. And those wedges are adorable, too!! Girl, them SHOES and the DRESS! You look too dang good. So in love with your wedges! This dress is amazing and I need those shoes! Are they comfy?